ETERNIA QUALITY SURFACE S.L. is a specialist in the manufacture of pavements and surfaces of artificial stone, using an innovative technology and materials in the sector. With the series Topstone in any of his scale, you will be able to enjoy the maximum quality, hygiene and exclusivity, a perfect mixture of the quartz of major purity together with a resin of quality polyester. TOPSTONE is manufacture from quartz stone, which gives the stone an appearance of great elegance, equivalent to a natural stone. The large range of colors and formats of TOPSTONE, guarantees the possibility to use it for any design or purpose. The usage of high quality polyester resins for the process of bounding TOPSTONE, gives a well known high resistance to scratching, blows and spouts. 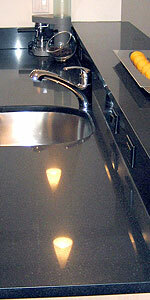 TOPSTONE is very easy to clean thanks to the resistance to scratching, blows and spouts.